Andrew Issacs, 33, of Westbury Lane, Coombe Dingle and Kemar Lewis, 29, of Havilland House, St Judes appeared before North Avon Magistrates’ Court charged with illegal fly-tipping and failing to supply waste transfer notes. An operation mounted by Avon & Somerset Police and South Gloucestershire Council officers led to the men being arrested and charged. The two men had been running a waste disposal firm under two names, Andrew & Sons House Clearance and Bristol Rubbish Clearance. They were contracted to remove a quantity of waste including derelict sheds from an address in St Andrews, Bristol but the waste was dumped in a country lane near the village of Tormarton, 15 miles from Bristol. Subsequently, the two were hired to carry out a house clearance in Brislington, just outside Bristol. The owner of the property thought Isaacs and Lewis were running a legitimate waste disposal firm, paying them £180 to take a load of rubbish away, plus another £100 for a second load. 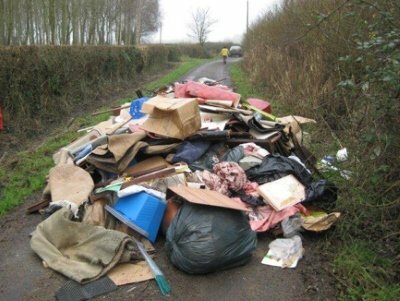 But the rubbish, including paint cans, old suitcases and clothes was later found blocking a lane in the village of Pilning, 11 miles from Brislington. South Gloucestershire Council’s emergency out of hours team had to be called into to clear the blockage on Gumhurn Lane. Isaacs and Lewis pleaded guilty to the charges when they appeared at the Magistrates’’ Court. Summing up, the Magistrate said that the men’s activities had deceived members of the public who had hired them thinking they were a bona fide company. They had caused a great deal of inconvenience by blocking roadways with dumped rubbish. Both men were handed down six-month jail sentences and each was required to pay £2,487 costs. House clearance cowboy jailed & vans crushed for fly tipping.